Deedee's Digis: Introducing Our May Guest Designer: Deanne of "A Little Bit O' Paper"
Introducing Our May Guest Designer: Deanne of "A Little Bit O' Paper"
My name is Deanne Clarke-Saunders. My hubby and I live in Paradise, Newfoundland Canada. I was an elementary teacher for 23 years but retired early. I am now an Early Childhood Educator (couldn’t stay away from the kiddies!!). I have always enjoyed playing with paper, scissors, glue, and ESPECIALLY crayons and pencil crayons, ever since I’ve been a small child. I just couldn’t stop playing, so I continued by scrapbooking and card-making! I love it!!! My hubby calls me a paper hoarder. He just MAY be right, but I’d never tell him that!!! A man doesn’t need to know he’s right!!! haha! Deanne used a set called "Chance of Showers" which can be found here (EU Only version) or here (non-EU Residents). This card features her favorite technique. I asked Deanne what was her favorite technique and why.... 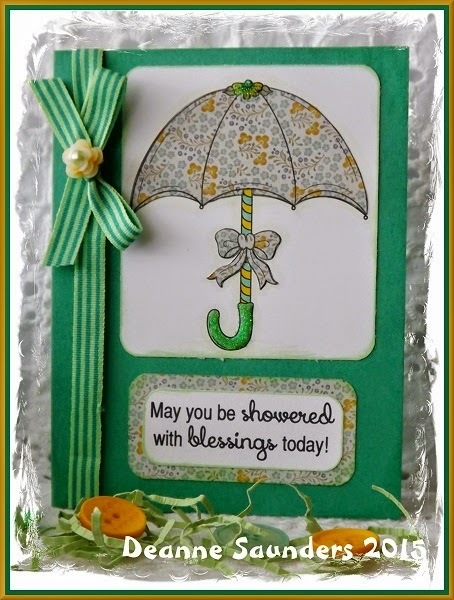 I LOVE LOVE LOVE paper piecing, especially when I have the perfect digi, it makes the cards just POP!!! And, you will notice that I paper pieced on EVERY single card for Deedee's this month.So that tells you there that Deedee's Digis are awesome digis and so much FUN to play with!!!! Be sure to come back next week to see what Deanne has to share with us. And why not head over to her blog - A Little Bit O' Paper - and leave her some love. You'll love her blog!! Deanne has done a wonderful job with this darling image. I must say I have to envy her paper piecing abilities. This whole card is just great, love the papers and colors. Thanks for sharing.